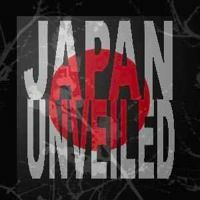 Hiroshima is a name steeped in emotions. 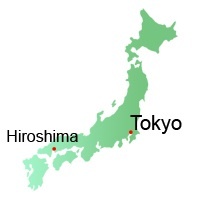 The first atomic bomb that ended the second world war was thrown on the city of Hiroshima. It is a relatively small town, with the Genbaku Dome, a UNESCO World Heritage site as it's main attraction. Miyajima is a small island, also known as Itsukushima. 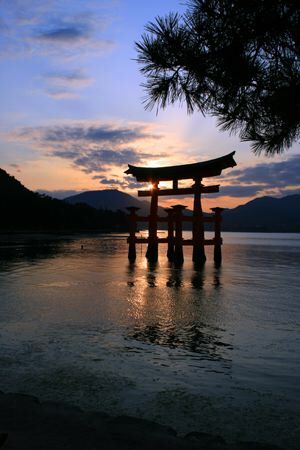 It is most famous for the Itsukushima Shrine, with its water-dwelling torii, and a UNESCO World Heritage Site. 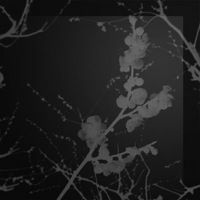 It is thought to be built in the era of Empress Suiko. 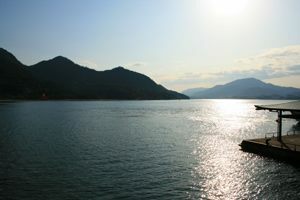 It is one of the Three great Views. After visiting Himeji we went on to Hiroshima. We arrived late in the afternoon in Hiroshima. We walked to our hotel, which we had booked in advance from our business hotel in Osaka. We dressed up and walked to search for a restaurant. Near to the hotel we saw some people leave a restaurant, and we decided to enter, even though it looked closed from the outside. When we entered we were the only customers. We were seated on the floor. We had no idea what to choose, and we could not read the menu, so using our Japanese Phrasebook we told the waitress that we let the cook choose. Since we were the only guest and because of our attempt to speak some Japanese with the waitress we were allowed to have close look at how the sushi and other amazing food was prepared. There was great sushi and tempura, and some things which were unidentifiable. When asked what it was, it was called tarako, and with our Lonely Planet Phrasebook we found that it was roe: the male fish sperm gland. It was supposed to be a local specialty of Hiroshima. Even though we were slightly disgusted by the idea of eating it, we did try. I can tell you, it is not too bad, but I did not like the texture of it, it felt a bit like eating a handful of flour. The next day, we visited the A-dome, and the Hiroshima Peace Memorial. 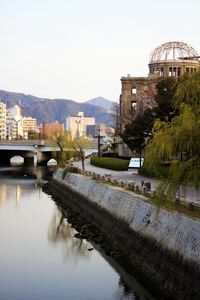 Apart from these two attractions, we found not much to do in Hiroshima. On top of that, it was weekend, and almost all the banks were closed, and none of the ATMs would accept foreign bank-cards; a thing you regularly face in Japan. We quickly moved on to Miyajima, as this was supposed to be really beautiful. We took the train that brought us to the ferry. There are ferries of different companies, but we took the Japan Rail ferry, because with our Japan Rail Pass, it was for free. 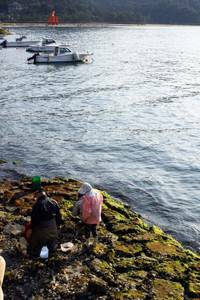 The trip took us some 40 minutes in total (from Hiroshima to the island), which is nothing compared to the reward you get when moving towards and around the island. 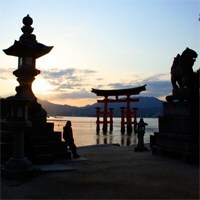 It is for a good reason that Miyajima is one of the three Great Views of Japan. 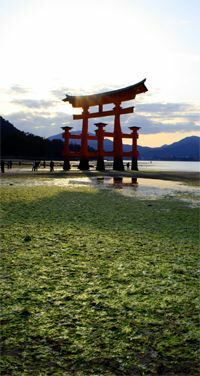 Not only does the island host the famous torii, it also has the Itsukushima Shrine, sacred deer, and still many local customs. 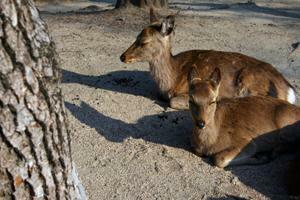 Miyajima is considered a sacred island, and the deer which inhabit the island are sacred as well, and are allowed to run around freely. It is a short walk from the ferry to the torii, passing several souvenir and more local shops. We arrived a low tide, and the torii stood completely above the water. But as the water rose, the ocean water slowly surrounded the torri, and a Great View was formed. With the sunset kicking in, the spell was only larger. Needless to say we spend a lot of time enjoying the view of Miyajima; it is truly a must-visit place when you are near Hiroshima. After spending another night in Hiroshima, we took the shinkansan train to Takayama early in the morning.